Alfa Romeo’s 4C Coupe is a bold sports car that offers hot looks and impressive performance. There’s also a Spider variant of the 4C featuring a convertible top, but in this space we’re mainly going to be covering the coupe configuration. The 2018 4C Coupe is composed of a carbon fiber monocoque chassis. It’s stronger, yet lighter in weight, than steel and “enhances the vehicle’s power-to-weight ratio for superior performance” according to Alfa Romeo’s website. Translation: this car can flat out fly down the roads of Washington D.C. and Arlington, VA.
For the new model year, Alfa Romeo has added a few new features to the 4C Coupe. You can opt for a front fascia with carbon fiber vents, and black leather interior seats with yellow stitching. When you add these new available features to the already long list of standard exterior and interior equipment, you’ve got a supremely equipped sports car. 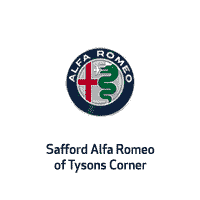 Safford Alfa Romeo of Tysons Corner has the 2018 4C Coupe and Spider available if you’re ready to step up to a true Italian styled sports car. It’s one of our most stylish models and always draws looks when shoppers arrive at our dealership located at 8448 Leesburg Pike Unit A Vienna, VA 22182. If you’re new to the Alfa Romeo brand, we strongly urge you to visit our facility in person to get an up close look at all our new Alfa Romeo vehicles. Our product specialists will be happy to arrange a test drive of several vehicles if you’re not completely sold on one particular model. If you’ve already zeroed in on the Alfa Romeo you want like the 2018 4C Coupe, then you’ll be happy to know we offer purchase and lease specials to assist with your transaction. Rest assured that our goal is to provide you with the most competitive package possible so that you can drive home happy in the Alfa Romeo model you want. The 2018 Alfa Romeo 4C Coupe is a two seat sports car that puts the comfort of the driver first and foremost in mind. Seats inside the car are contoured and designed to provide maximum comfort while you drive the vehicle on the roads around Vienna and surrounding VA areas. The 4C Coupe also comes appointed with high-end interior features like a leather wrapped steering wheel, Alpine audio system, USB/Aux ports, and a 7.0-inch Driver Information Display. The 2018 4C Coupe comes with standard 17-inch alloy wheels in the front of the car and 18-inch wheels in the back. The Italian style of the sports car is accentuated in the rear by a dual exhaust system with chrome tips along with LED taillights. A punchy 1.7L turbo-four engine is standard under the hood of the 2018 4C Coupe. This powertrain delivers 237 horsepower/258 lb-ft torque and is mated to a six speed dual clutch automatic transmission. YIn addition to providing incredible purchase and lease specials on new Alfa Romeo models, we’re also your premier source for luxury auto maintenance in the area. Our highly-skilled technicians can handle all regularly scheduled factory maintenance along with extensive repair work. Check out our service specials online and then book your next service appointment at our Vienna, VA auto maintenance facility.